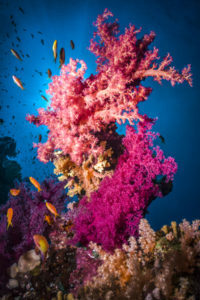 Tobias Friedrich started taking underwater photos in 2007. 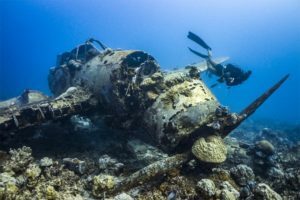 Since then his images have been published in prestigious scuba diving magazines such as Sport Diver, Unterwasser, Tauchen, Scuba Diver, Through The Lens and many others. 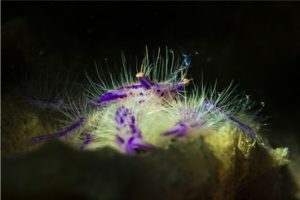 In 2018 he won the coveted Underwater Photographer of the Year competition. 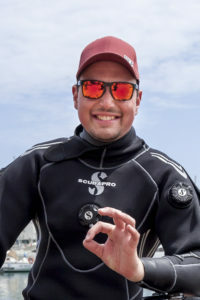 Tobias is always passionate for new challenges and up for new, creative ways in underwater photography. Below, find some of his best images taken with the SeaLife DC2000 and Tobias’ advice on how to compose and capture the best shot in various underwater shooting scenarios. And keep in mind, with the DC2000, you don’t have to be a professional to get great results, simply follow these basic steps and you’ll capture some amazing photos. One big advantage of compact cameras over big DSLR setups is that you can hold the camera easily into tiny spaces and still float above the reef to not disturb animals or touch corals. 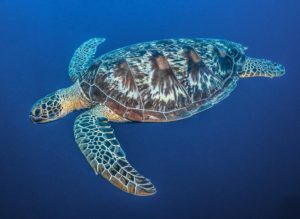 That close-up perspective was ideal to photograph the turtle while eating soft corals and not disturbing it. It was important to use the diffuser on the strobe to soften the light on the turtle and not to give it too hard of shadows. 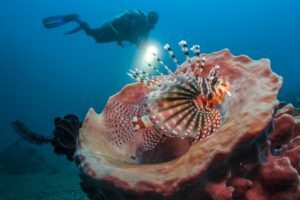 Light is one of the most important things in underwater photography. In this case I used the spot light of the Sea Dragon 2100 Dual Beam Light to get a spot just right on the eel. To make the effect even more dramatic I had the light in my left hand and formed the light with my fingers to get a more narrow beam. With subject close to the ground it’s also important to get the cameras perspective as low as possible as well. 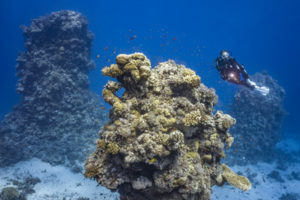 If you are in a situation with great visibility or near large structures like rocks or reefs, it’s always a good idea to include a diver into the image so that the viewer is able to compare sizes of the natural surroundings to a human being. This photo was taken with a DC2000 and no light in Dive Mode with the new 0.5x Wide Angle Dome Lens. The water’s absolute clarity adds to the tremendous size and depth of the image. 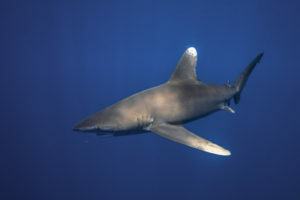 Photographing sharks is easy when you know what to do. By taking a test shot and adjusting the camera to over or underexpose you can control the blue in the background. Afterwards focus on the ground or anything else in the same distance like the sharks, hold the shutter button half pressed and wait for the sharks to be in a nice position before you press the shutter completely. Removing the diffusor from the strobe helps the light to reach further through the water. For this Nudibranch I used the DC-Series Super Macro Lens to be able to get closer to the subject and to have it bigger in the frame. 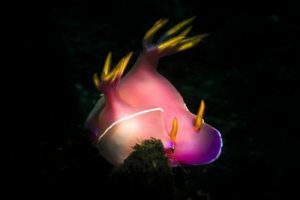 Additionally I used the Sea Dragon 2100 Dual Beam Light from the very left side on spot function and also formed the light with my fingers to give the nudibranch just a touch of light. The blue and red background lights are coming from my DSLR, which I placed on the sandy bottom, while shooting with the DC2000 camera. It gave a nice additional effect. 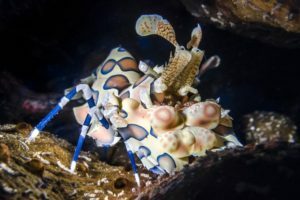 If you want to get good colors in your images, you need to be as close as possible to the corals so that the Sea Dragon Universal Flash can reach the subject and return to the camera. 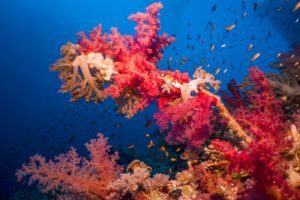 Red light can only travel up to five meters underwater – so if you are too far from the subject, your image will lack natural color. 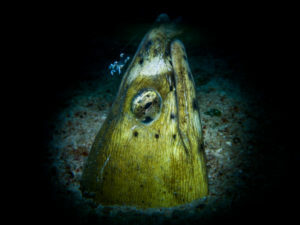 The SeaLife 0.5x Wide Angle Dome Lens is very important for images like this as it shortens the distance to the subject. 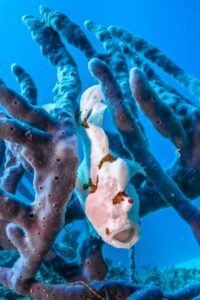 Not only wide-angle scenes can be taken with the SeaLife 0.5x Wide Angle Dome lens, but also close-focus wide-angle shots like with this nicely sitting Painted Frogfish in a blue sponge. 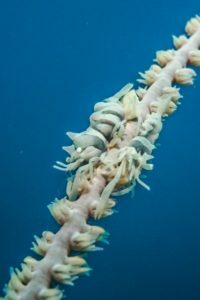 When photographing small subjects like this beautiful Bali Solar Powered nudibranch (Phyllodesmium iriomotense), try to get your perspective as low as possible. 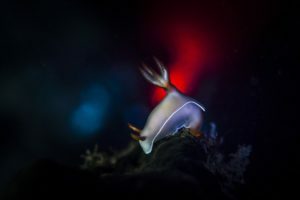 Then with a spot light or torch (In this case the spot feature on the Sea Dragon 2100 Dual Beam) also very low to the ground and facing up slightly, the light will touch the animal and create a beautiful lighting effect. Even though you can get really close with the Super Macro Lens, the quality of the DC2000 is good enough to crop the image a little bit as well to make the smaller creatures appear larger. When taking underwater images like this, make sure that the subject floats over a nice background and that you are photographing slightly upwards to get as much blue water in the shot as possible.The diver in the background holding a dive torch makes the image perfect. Photographing fish underwater is not always easy, as they are easily scared and just turn their back to the camera. The trick is to stay calm, approach very slowly and wait for the fish to return to the same place and get used to the diver and the camera. Do a test shot to get light and background blue correct, press the shutter half to focus and wait for a good moment and a nice formation for the actual photo. Try it again and again if it doesn’t work out the first time. 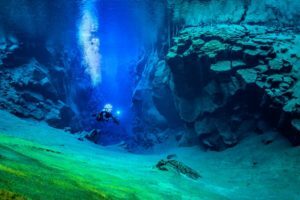 Taking images in cold water like Iceland isn’t always easy because most cameras can’t be controlled easily with gloves. 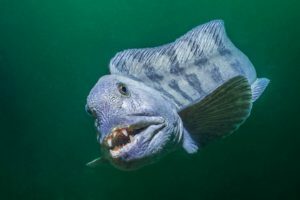 Luckily the SeaLife DC2000 has large buttons and controls so even in these harsh conditions, you are in full control over the camera, especially in situations like this when a Wolffish comes really close. When you approach the animals very slowly they will remain calm and stay put to photograph. In a situation like this you might still only have two to three photos to take before the animal disappears. So it’s recommended to have the settings of your camera set correctly and tested before you approach the animal. Take your test shots on an inanimate object with same or similar lighting conditions. 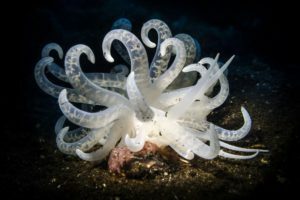 Slow or non-moving sea creatures are predestined to test your lightning skills and experiment with your strobe. With light angle and intensity you can illuminate the parts of an image that are interesting and beautiful, like this Scorpionfish, and eliminate the unattractive background from the image. 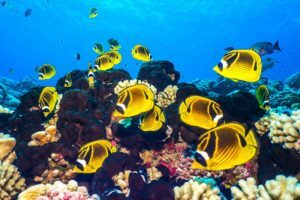 If you’re shooting a reef-scape, waiting for the right moment is important in composing a good photo. 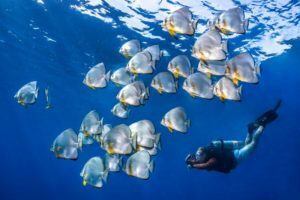 Usually fish disappear from the reef when divers are close, but they’ll come back in little time if you wait and stay calm. When a fish swims into the image, be ready and press the shutter button. When you shoot in Super Macro Auto-Focus mode and set your camera to capture JPG + RAW images, you will have the original image in RAW format with the ability to crop and edit it to your liking using popular image editing software such as Adobe Lightroom or Photoshop. 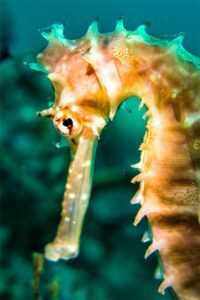 When photographing vertical subjects, like this Seahorse, be sure to put your camera in portrait mode to be able to get as close as possible to the subject. That will result in the best quality image and preserve the intricate details of the creature. 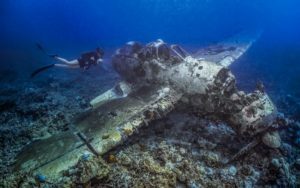 Shoot diagonally so you can frame the entire subject into the photo, like the wings of this Japanese Sea Plane in Palau. 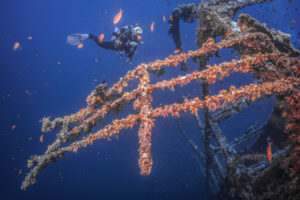 Placing a diver next to the wreck gives the viewers an accurate idea of the scale of the object. In a cave or cavern like this, you’ll always get a good silhouette image by shooting from the inside out. 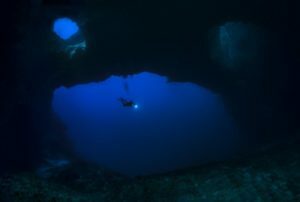 Place a diver into the open blue, possibly with a light, to create a great composition. 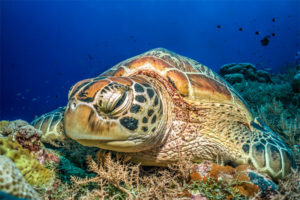 Turtles often feed at the bottom or take a breath at the surface. In between, they ascend or descend quickly, it’s during this moment that is the perfect opportunity to shoot an image of the animal with a simple blue background. 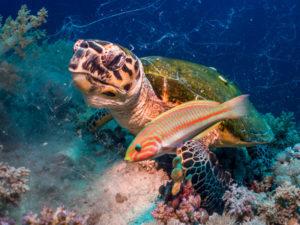 Be sure to not prevent the turtle from breathing or feeding by keeping some distance from the animal. Super Macro mode gives you the opportunity to get really close to the animals and to be able to see all of their tiny details. The quality of the DC2000 is good enough to crop the image afterwards to even get closer to the subject. Having clean images with nothing that distracts from the main subject is important in wildlife photography. 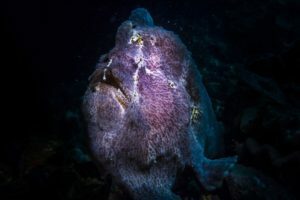 In this case this giant Frogfish was sitting under a rock with a nasty background behind it. 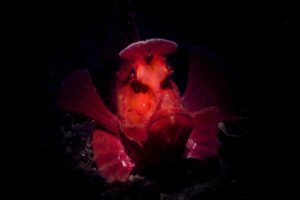 To be able to mask the Frogfish and to get a clean, black background I used the spot function of the Sea Dragon 2100 Dual Beam Light so that the light only hits the fish and not the background. 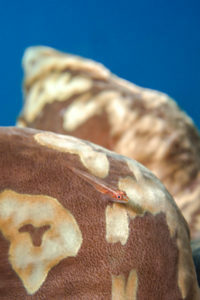 Trying to shoot a simply composed image with shapes and objects usually results in a pleasing result for the viewer, like this image with a spherical coral head and two little fish above it. 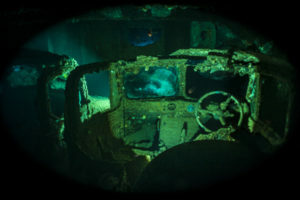 If you get to photograph wrecks try to work with diagonals to make the wreck fit in the image nicely. You can also just work with sunlight, but always go with the light (sun in the back) to make the colors come out. The shallower, the better, for ambient light shots. The DC2000 is the perfect camera to squeeze into small holes where a larger camera system simply won’t fit. If your photo/video light doesn’t reach the subject completely, remove it from the grip or arm and light it up from the side or above. 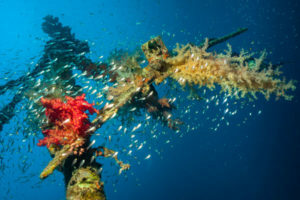 Shooting schooling fish is one of the most difficult things to do in underwater photography. You need to be patient and still until the school is very close and as dense as possible. Another diver acts as a model and also helps to keep the school together. Photographing against sunlight usually results in a burning image of the sun and a dark foreground. To avoid this, place something in front of the sun and close the aperture as much as possible and increase your shutter speed. Be sure to use a flash or strobe in cases like this. In addition to the light from your strobe, placing a light behind the object adds a colorful sunbeam-like effect. 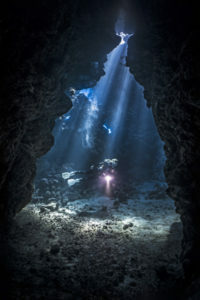 In this case, a Sea Dragon 2500 light head was used. This works best at night or inside wrecks. 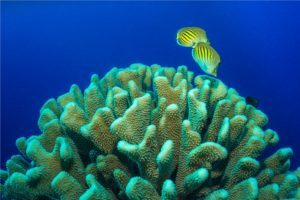 A small fish or object, when sitting on a monochromatic background, can create a great image when you follow the basic rules of composition and keep diagonal subjects in the image. In situations with low visibility, change your perspective and photograph upwards towards the surface to get as much light into the image as possible. The result is a much richer blue background, use your strobe to best bring out colors in your foreground subject. A wide angle lens will add shooting angle and fill your image with more of the colorful subject. Adding the sun into your image is a desirable effect. The problem is that the large sunburst can white out your shot. To avoid this, increase the DC2000 shutter speed to 1/1250s. The Sea Dragon Universal Flash can synchronize at that speed and get good light and color into the foreground. 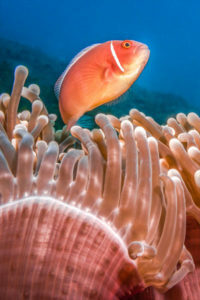 Anemonefish are good subjects to test your skills underwater. They stay in place and allow you to get very close. The most important thing is timing the shutter button at the right moment so the fish looks good in the frame. With a little practice, you’ll get the perfect shot! 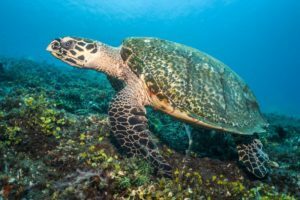 Marine animals, like this Hawksbill turtle, are often some of the most difficult subjects to photograph. But if you remain calm, move very slowly toward the animal, and avoid making too many bubbles, they’ll let you come close. 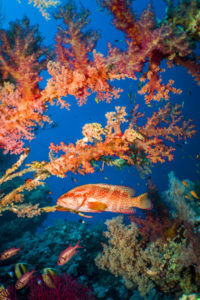 If you find a nice spot in the corals, wait a few minutes with the camera in position until a fish swims into the image. 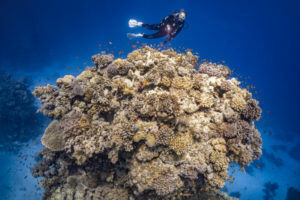 Most fish will return after a few minutes, after first fleeing from the divers bubbles. Sometimes it’s better to shut off the strobes or lights and to just work with the available light in a shot. The sun’s rays in the caverns come out best with a slow shutter speed. 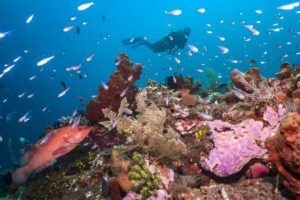 With bright sun in the background, and with a shallow depth of less than 10m/30’ from the surface, you won’t need any lights or strobes to be able to get nice colors from the reef. As you move closer or deeper, consider adding strobes or LED lighting. 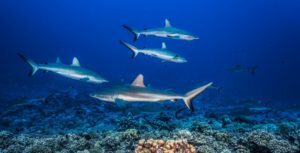 For shark photography, wait until the animal is as close as it will get so that the shark sits nicely centered in the full frame of the image before you press the shutter. If you take the image too early, the shot will lack color and detail because the animal is too far away. 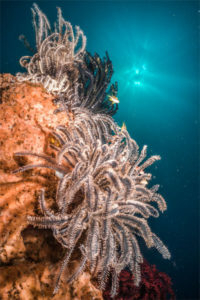 Sea Dragon lights can be removed quickly and easily from their Flex-Connect mount and your camera set with just the press of a button. 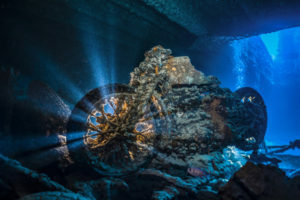 Remove your light and place it (or place several lights) behind a subject, such as this part of a wreck, to create an interesting and indirect light effect. If you aren’t able to photograph the complete wreck, try to highlight interesting parts of it. Place your subject in front of blue water, along with a model, to make the part of the wreck stand out even more. Placing subjects at different distances creates depth and dimension in the image. Mind your aperture and settings as the distance from foreground to background changes.